According to a statistic that we're just about to make up, Austin has 36% more fun in the summer than anyone else, despite sweating 55% more than anyone else. 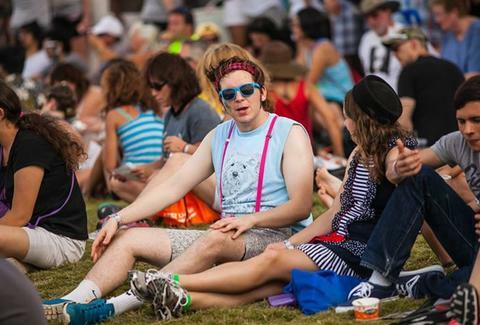 To make sure this summer's hot in the right kind of way, don't miss these 14 must-hit fests. Republic of Texas Biker Rally It’s like Sturgis in the South. Thousands of bikers take over Austin for a weekend of loud bikes, louder music, and biker babes. Republic of Texas Biker Rally Travis County Expo Center It’s like Sturgis in the South. Thousands of bikers take over Austin for a weekend of loud bikes, louder music, and biker babes. Luling Watermelon Thump A weekend full of large melons, seed spitting, and watermelon-eating contests. How is this only once a year?! Luling Watermelon Thump Downtown Luling A weekend full of large melons, seed spitting, and watermelon-eating contests. How is this only once a year?! Keep Austin Weird Fest and 5k Prepare for a 5k run with off-the-wall costumes, live music, a sideshow, and a ton of weirdness. Keep Austin Weird Fest and 5k The Long Center Prepare for a 5k run with off-the-wall costumes, live music, a sideshow, and a ton of weirdness. Capital City Comic Con Tons of artists and comic book companies will make the city of Austin cosplay as a comic book convention for the weekend. Capital City Comic Con Palmer Events Center Tons of artists and comic book companies will make the city of Austin cosplay as a comic book convention for the weekend. Classic Game Fest It’s the largest classic game festival in the state. Arcade competitions, costume contests, and a swap meet are all happening. Classic Game Fest Palmer Events Center It’s the largest classic game festival in the state. Arcade competitions, costume contests, and a swap meet are all happening. RTX Yes, Rooster Teeth are back to bring the best bits of the internet into the real world, and they're expecting a staggering 45k people this time. Get tickets, or get disappointed. RTX Austin Convention Center Yes, Rooster Teeth are back to bring the best bits of the internet into the real world, and they're expecting a staggering 45k people this time. Get tickets, or get disappointed. Austin Ice Cream Festival Get gratis ice cream samples from Austin's best creameries, some live music, and the knowledge that it’s all for a good cause. Austin Ice Cream Festival Fiesta Gardens Get gratis ice cream samples from Austin's best creameries, some live music, and the knowledge that it’s all for a good cause. Anime Overload A smaller anime convention for anime fanatics. Expect cosplay contests and gaming tournaments. Anime Overload Holiday Inn Austin Midtown A smaller anime convention for anime fanatics. Expect cosplay contests and gaming tournaments. Bat Fest Celebrating the Mexican free-tailed bats that call Austin home, there’s live music, a bat costume contest, and if you’re lucky, over a million bats will emerge from below the bridge at dusk. Bat Fest Congress Ave Bridge Celebrating the Mexican free-tailed bats that call Austin home, there’s live music, a bat costume contest, and if you’re lucky, over a million bats will emerge from below the bridge at dusk. Austin Pride Week A weeklong celebration to the LGBTQ community and equality. It'll feature fashion shows, a festival on the shores Lady Bird Lake, and a parade that starts in front of the Texas State Capitol. 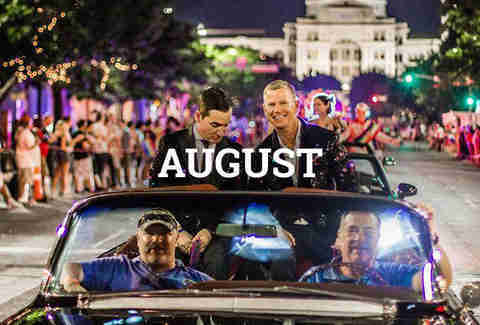 Austin Pride Week Downtown A weeklong celebration to the LGBTQ community and equality. It'll feature fashion shows, a festival on the shores Lady Bird Lake, and a parade that starts in front of the Texas State Capitol. Austin Chronicle Hot Sauce Festival More than 300 glorious hot sauce companies gather to sample some of their mouth-immolating wares to the public. There's free entry with canned good donation or cash donation to Capital Area Food Bank of Texas. Austin Chronicle Hot Sauce Festival Fiesta Gardens More than 300 glorious hot sauce companies gather to sample some of their mouth-immolating wares to the public. There's free entry with canned good donation or cash donation to Capital Area Food Bank of Texas. Out of Bounds Comedy Festival Workshops and live stand-up comedy from today’s up-and-coming comedians and improve groups. Out of Bounds Comedy Festival Multiple venues Workshops and live stand-up comedy from today’s up-and-coming comedians and improve groups. Texas Craft Brewers Festival The only craft beer festival in the state that is dedicated solely to Texas craft beer. Many breweries will be bringing seasonal, special, rare, and one-off beers for you to sample. Texas Craft Brewers Festival Fiesta Gardens The only craft beer festival in the state that is dedicated solely to Texas craft beer. Many breweries will be bringing seasonal, special, rare, and one-off beers for you to sample. Fantastic Fest It’s the largest genre film festival in the entire country and it brings in celebrities and fans for a week of new releases, panels, and star-studded parties. 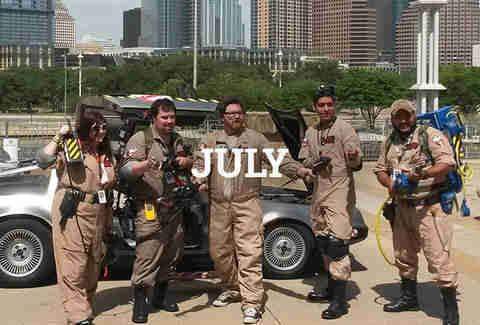 Fantastic Fest Multiple venues It’s the largest genre film festival in the entire country and it brings in celebrities and fans for a week of new releases, panels, and star-studded parties.